Having just wrestled with drag-and-drop for the last few hours, I figured I'd better document what I've been through in the hope of saving someone (maybe myself) some time the next time this comes up. What I wanted to do seemed like a simple task: drag the gradient array from one graphic image to another. This ended up with several hours of experimenting and seemingly unexplainable failures, finally ending up with a bunch of "put into msg" statements to figure out what was going on. In chronological order, the dragStart message is sent to the source control when you start dragging from it. 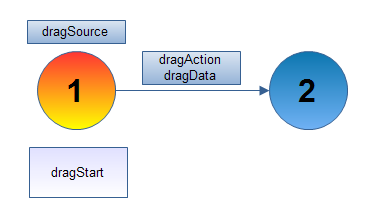 If you want to be able to drag it or its contents or something else from a control then you must have a dragStart handler either in the control or in its path. This could possibly mean in the owning group or in a behavior control. In the dragStart handler you need to specify what will be dragged and in what format it will be supplied. Note in particular that you can *not* use arrays as draggable data - if you need to drag array data then you need to combine it into a string representation before setting it as the dragData. 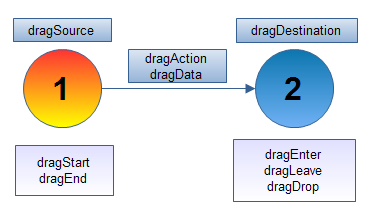 See dragData below. set the allowableDragActions to "copy"
set the dragAction to "copy"
combine tGradient using tab and ":"
set the dragData["text"] to "hello, world"
set the dragData["private"] to "top secret"
because the second incarnation ("private") will overwrite the first and you will lose the "text" part. For this reason (and after much experimenting) I ended up using "private" for all my dragData. That way I could put "fill" or "stroke" into line one of the dragData and fill the rest with with string gradient values. 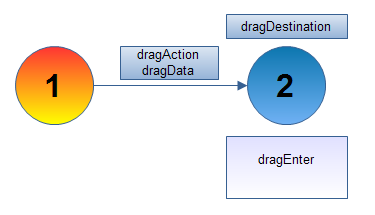 The dragEnter message is sent to a control when the mouse moves over it while dragging data. This is essential - if you don't have a dragEnter handler in the destination control or somewhere in its path then it will not be a candidate for dropping the data (the cursor will not change to a drop cursor and you won't be able to drop data onto it). Another way of saying this is that if you want to enable a control as a destination for dropped objects you need to add a dragEnter handler to its script. The dragLeave message is sent to a control when the mouse leaves it. I didn't need to use the dragLeave message, but you could use it if you wanted to control the visual display of the image, for example. 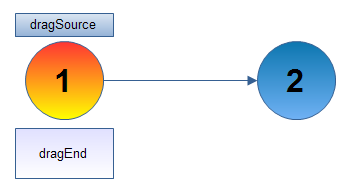 In the end I opted not to use the dragSource and instead to place the source type as the first line of my private data. Using the dragSource would have worked as well, but for my needs here it would have limited dragging from only those objects, and I wanted a more generic solution. 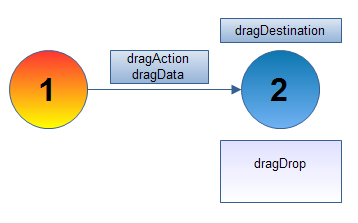 The dragDestination is also a long id, this time of the control that is the recipient of the dropped data. See the dragDrop description below to see how I'm using this. 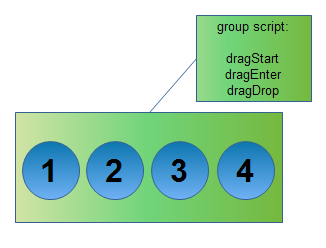 The dragDrop message is sent when the mouse is released over a valid drop candidate control. Here's where you want to handle getting the dragData information and doing something with it. As noted above, I opted not to use the dragSource to determine the type of gradient and so I'm extracting that data from the first line of the private data. Then I delete the first line since I'm done with it, and what's left over is the contents of the gradient array. 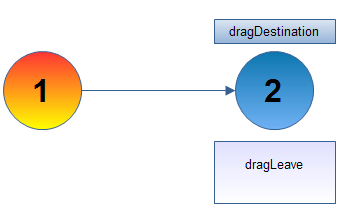 I copy the gradient array I extracted from the dragData over to the dragDestination control. 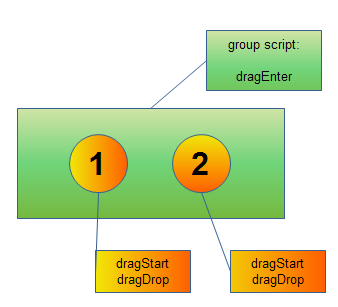 split tFillArray with tab and ":"
The dragEnd message is sent to the source control after the drop has occurred. I didn't need to do any postprocessing, so I'm not using this message. But here's where you might check the dragDestination to see where the data went, especially if you're moving data rather than copying it. Prev: How do I use the same controls on multiple cards?